The SU-26 is a Soviet tier 3 self-propelled gun. 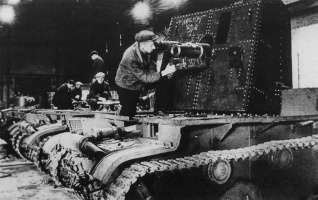 The self-propelled gun on the basis of the T-26 was developed in sieged Leningrad in the autumn of 1941. The production was deployed at the Kirov Lifting and Conveying Equipment Plant. About 12 chassis were equipped with 76.2-mm guns (presumably, 76.2-mm infantry support guns mod. 1927). 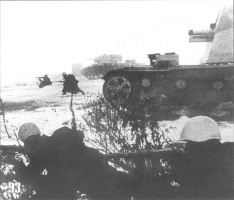 The vehicles saw service in Red Army armored brigades that fought on the Leningrad Front until 1944. This SPG was a favorite among many players. After update 0.8.6 a lot of changes applied for SPG's as a whole, making it more challenging to play. Though it's the slowest artillery in its tier it has a small silhouette, making it a moderately difficult target to hit. Its primary advantage is the turret -- although it turns slowly and has no armor it is the only Tier III artillery that has one. With this turret you don't need to traverse the whole tank to shoot at the enemy, thus making it harder to detect when hiding in a bush. The Su-26 has an impressive aim time and can shoot across the map. But the farther you shoot the harder it is to aim, and you may have to move closer to be effective. The gun -- although it has low damage per shot and low splash damage -- has the highest accuracy and quickest rate of fire among the Tier III SPG's, earning it the name Popcorn Catapult of Doom. This makes for a fun play style: keep shooting at enemies without thinking, and if you miss simply shoot again. Overall this is a fun SPG to play. The SU-26 leads to the SU-5. This SPG starts out with the same gun as the SU-18, which can be painfully weak at this tier. 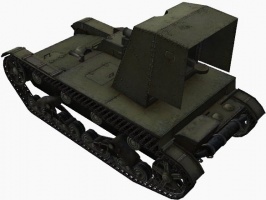 Since it uses the T-26 chassis it uses the same engines as the T-26. The turret allows this SPG to be far more stealthy than other SPG's because it doesn't have to turn its chassis. Therefore you definitely want to use a Camo Net since you don't have to break the camo bonus by turning. Unfortunately it has the lowest range of all tier 3 SPG's, so it has to get uncomfortably close to the fighting. Still, a turret on an SPG is an extremely rare feature, so many players choose to keep the SU-26 permanently. The turret allows you to use some special tactics -- you can position your SPG horizontally next to a rock, then move backwards to expose your turret to fire. When you start getting shot at simply move forward and hide behind the rock. 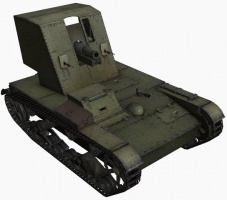 In close combat the turret can give it an edge over other SPG's; either by popping out and firing or running away while keeping your turret and gun pointed the other way. If you can get beside turret-less Tank Destroyers or the M3 Lee, you can often side scrape them though you might have some difficulty keeping up due to your low mobility. Your turret allows you to fire upon them while they can't return fire. However this is a risky tactic that should not be relied upon. Comparing this SPG to the other Tier III SPG's, the top gun has much worse damage, but much better penetration than any of the 105mm guns on its counterparts due to its 80mm pen AP round. This means that the SU-26 will do much better attacking less heavily armoured targets that this round can penetrate. (But note that the Su-26 and most other SPG's now only carry HE rounds as of several patches ago.) Do not waste your shots on the well-armoured KV-1 or similar vehicles unless you really need to pin them down (and remember to use HE) - the most you'll do is scratch the paint. Instead, use your guns to soften up mediums and lights, so they can be dispatched by your team. A French heavy or a side hit on a T1 HT or M4 can also be relied on for serious damage. The Su-26, also known as Su-T-26, Su-76P or Leningrad self-propelled gun, was produced in 1941 by the Factory of Hoisting-and-Conveying Machinery named after S.M. Kirov in Leningrad. According to one source (1) 14 were built, probably two with a 37mm gun and 12 with the 76.2mm regimental gun mod. 1927. Another source (2) speaks of 15 built, with no mention of any 37mm gun. T-26 with the A-43 turret - artillery T-26 or "tank of fire support" with a turret developed by self-taught inventor N. Dyrenkov at the Experimental Design Office of the Department of Mechanization and Motorization of the RKKA (UMM RKKA). Two types of turrets, armed with the 76mm regimental gun mod. 1927 and DT tank machine gun in a ball mount, were assembled by the Izhora Factory. They were partially pressed and welded. 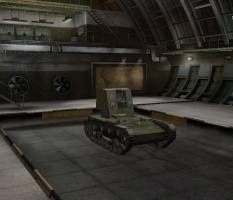 The first variety was installed on the T-26 mod. 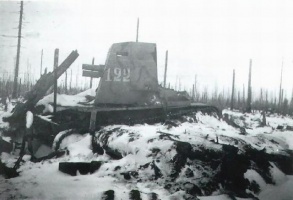 1931 in February 1932, and the second type was used in November 1932 (in the last case, the rear armored plate of the under-turret box was made sloping). It was found that the A-43 turret was very tight for two crew members. 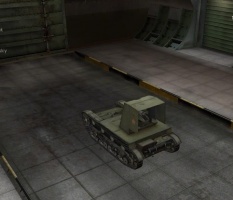 It had an insufficient observation field, there was no turret ventilation (which made continuous gunfire difficult), and it was hard to rotate the turret manually. At the beginning of 1933 a new 76mm KT tank gun mod. 1927/32 with reduced (from 900 mm to 500 mm) recoil length was installed into the A-43 turret. Nevertheless, it was proved again that the turret was still a very tight place for crew members. In addition, the ammunition stowage for 54 rounds was unsuccessful. As a result the military refused the A-43 turret. T-26-4 — artillery tank with enlarged turret armed with the 76.2mm KT tank gun mod. 1927/32 (some modern sources mention this tank as T-26A, A stands for artilleriysky or "artillery"). The turret was developed by the Bolshevik Factory (since February 1932 - by the Design Office of the established Factory No. 174) in 1931-1932, and was installed on the T-26 mod. 1931 in November, 1932. 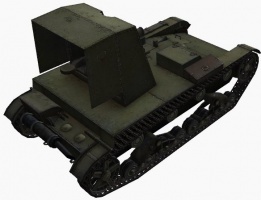 Unlike the A-43 turret, the turret by Factory No. 174 was much more convenient for the crew. The turret of the T-26-4 was quite similar to the main turret of the T-28 medium tank. 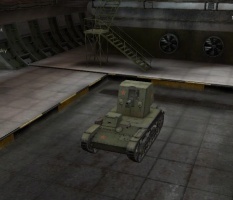 The T-26-4 with the KT tank gun passed tests successfully and five vehicles were built in 1933-1934 as a pilot batch. Initially it was planned to arm three of these T-26-4s with the 76.2mm KT tank gun mod. 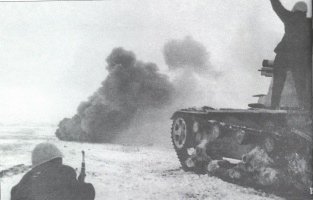 1927/32, and the other two tanks with the 76.2mm PS-3 tank gun. The PS-3 tank gun was developed at the Experimental Engineering-Mechanical Department (OKMO) of the Factory No. 174 by engineer P. Syachentov. The PS-3 had better specifications in comparison with the series-produced KT tank gun and also had several technical innovations (foot firing switch, original training gear, traveling position-fixing, binocular optical sight). 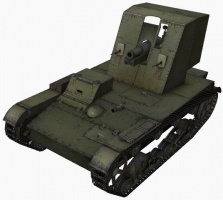 Armed with the PS-3 tank gun, the T-26-4 was tested in October 1933, but it was found that the PS-3 was too powerful for the T-26 light tank; the turret race ring and hull roof were deformed during gun fire, and the suspension springs were damaged. 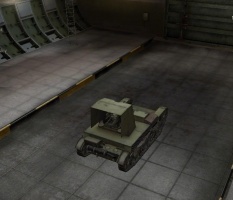 It was decided to arm the T-26-4 with the 76.2mm KT tank gun only. All five experimental T-26-4 artillery tanks were tested during military exercises near Leningrad in September 1934, before a scheduled series production of 50 such vehicles in 1935. But on September 19th, 1934, an incident with a T-26-4 took place: a blow-back because of shell case destruction during gun fire. Despite the fact that this defect was unrelated to turret design, the military representatives cancelled the order to produce the T-26-4. Also, the work to design the turret-less AT-1 artillery tank armed with the powerful 76.2mm PS-3 tank gun began at that time. Nevertheless, the T-26-4's turret construction was the design used in the series-produced BT-7A artillery tank.